The attached is a great article and I recommend you read it. At its heart, it underlines the vital need to strip out hierarchy in meetings and replace it with full equality amongst attendees and in team structures. In businesses that really thrive, there is no monopoly on ideas and there's no dictat on who may speak in meetings - especially when those gatherings relate to brainstorming new opportunities. The trick of course is to encourage managers to speak a lot less and all other attendees - including the quietest members - to contribute a lot more when they'd like to. I could write a lot more here, but instead, I'm going to turn my energies to thinking about how I can be better at following this social code, to ensure that the teams with whom I work and the brilliant individuals within them, all have the best chances of achieving their full potential and making the best contributions possible to our collaborations. 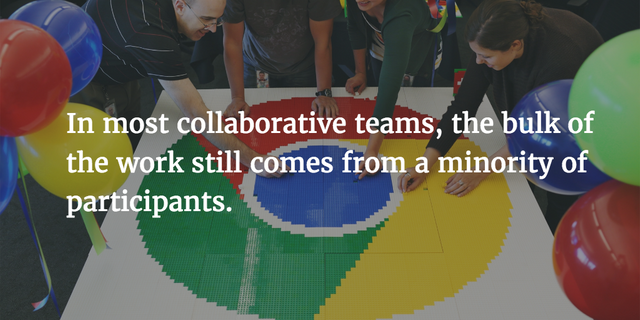 Google’s secret social code That social code was tacitly agreed upon, and usually instituted by the managers: the most collaborative teams, even if they have a single leader or moderator, were ones where everyone spoke equally. This fact wasn’t written down anywhere, or decided upon by management. The teams themselves didn’t even notice they were doing it. But researchers recognized that less successful teams were the ones where a manager spoke 80% of the time or more. In successful collaborative teams, everyone engaged in “conversational turn-taking”—one of the most human things we do— whether it was through a daily standup or a monthly check-in.